I’m in Cumbria but this is not Cumbria. Catching up on some swimming moments as work has been too busy lately. This was last Tuesday in Clevedon marine lake. Don’t be misled by the blue sky and cute white puffy clouds, a vicious Arctic wind was howling onshore. This time the seagulls did not stand on the wall observing me, they surfed the gale, watching with curiosity to see if the foolish human would freeze. I wished I’d worn gloves. 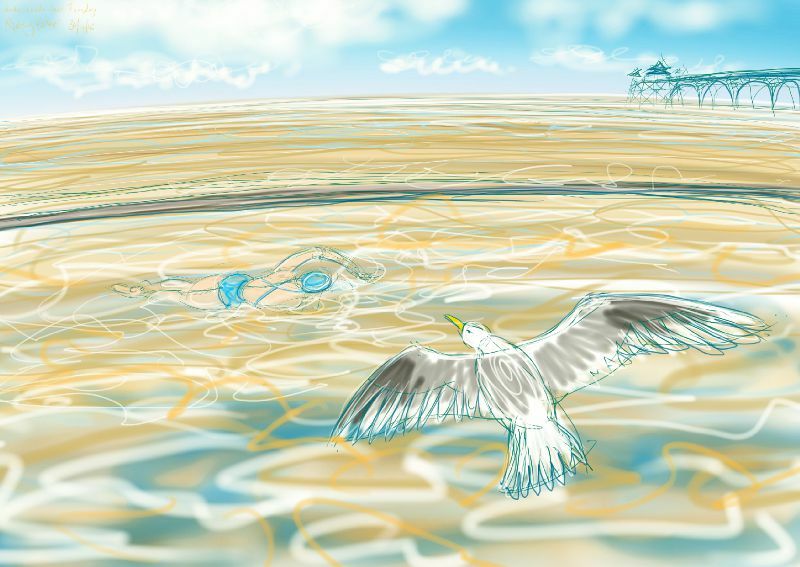 This entry was posted in swimming and tagged art, Clevedon, Clevedon Marine Lake, Clevedon Pier, cold water swimming, digital drawing, open water swimming, seagull, swimming on May 1, 2016 by Nancy Farmer. I was in too at lunchtime. It’s not so bad once feeling has left the fingers and toes! It doesn’t seem to be warming up at all! Love the pic.